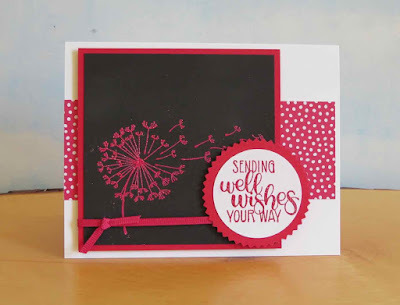 Karina's Kreations: Stampin'Up Dandelion Wishes Embossed Card! Stampin'Up Dandelion Wishes Embossed Card! Stampin'Up has some new embossing powders. The powders are sold in a set of 5 and come in the new 2018-2020 In-colors. I made this Dandelion Wishes card with the Lovely Lipstick embossing powder. TIP: Make sure to use an embossing buddy to prevent the powder from sticking where it doesn't belong. I love that Lovely Lipstick comes in the coordinating card stock, designer series paper and ribbon. Click on a picture below to order the supplies to make this card. Remember I'm offering FREE shipping until July 28th.